We Help You Change The Past! It’s ok. We all change our minds from time to time. Colorado Laser Treatments Tattoo Removal in Longmont offers affordable and safe options for tattoo removal and gets you the results you want…or sometimes need. 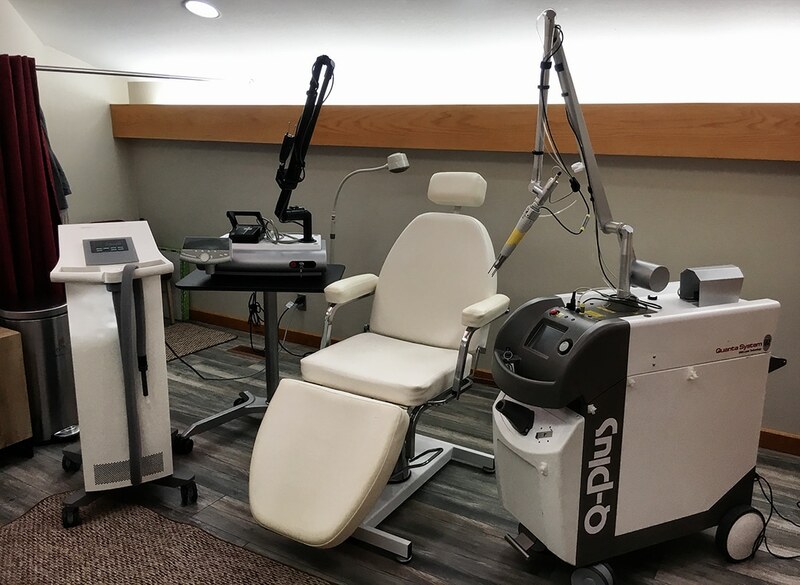 Our state of the art Quanta Q Plus laser system (the best triple laser system available) and trained tattoo removal technicians will restore your look without crushing your budget! Toenail Fungus Removal. Only $400 for UNLIMITED treatments. Learn how effective laser removal for toenail fungus can be! Skin Resurfacing Using Laser Technology. The treatments are quick and involve little if any discomfort. The skin in the treated area painlessly peels off in two to three weeks and is replaced by more collagen-rich skin. Learn more about our safe, effective skin resurfacing services. Tat2Undo has decided to close its doors but you still have options. All Tat2Undo client records have been securely and safely transferred to Colorado Laser Treatments where we are happy to help with your tattoo removal needs. If you have an existing prepaid package or pricing for tattoo removal with Tat2Undo, Colorado Laser Treatments will honor those packages and pricing. For the clients who choose Colorado Laser Treatments to continue their tattoo removal we will offer $30 off your first paid treatment with us and offer discount packages Please contact Colorado Laser Treatments at 720-552-2411 for more information. If you would like to schedule a treatment please call 720-552-2411 or book an appointment today! How Much Does It Cost To Have My Tattoo Removed? Traditional laser tattoo removal pricing is based on the size of the tattoo and the colors in the tattoo. The larger the tattoo, the greater the ink density, and the use of different colors result in a higher cost, and usually, the greater the number of laser treatments and the longer the time between treatments (it takes the body longer to absorb large quantities of ink). Some colors require more treatments to remove. Colorado Laser Treatments will work with you to customize your treatment costs. Our Trained & Friendly Tattoo Removal Technicians Use The Quanta Q Plus Laser System. The best triple laser system available. Our laser tattoo removal technicians have the best training available in treatment processes, laser safety, treatment maximization, and pain minimizing techniques. We take advantage of a variety of skin cooling methods from simple local icing to the application of cold plates to the use of the Zimmer Cryo 5 cooler. The cooling of the skin before, during and after the treatment process ensures minimal discomfort Our clean and reliable Cryo 5 system continuously blows cool air over the treatment area and is ideal for removing larger tattoos. Need an after-hours appointment? Colorado Laser Treatments in Longmont will work to fit your schedule. Call or email today to and schedule your consultation or treatment.